Outrider font family series mainly provide Regular and other font styles. 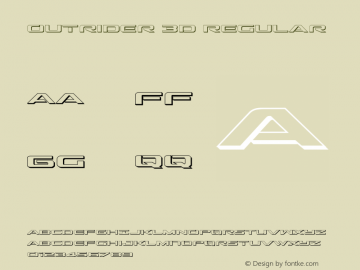 Outrider 3D font family series mainly provide Regular and other font styles. 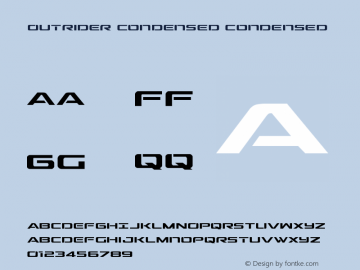 Outrider Condensed font family series mainly provide Condensed and other font styles. Outrider Expanded font family series mainly provide Expanded and other font styles. Outrider Italic font family series mainly provide Italic and other font styles. 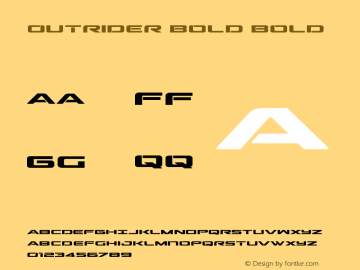 Outrider Bold font family series mainly provide Bold and other font styles. 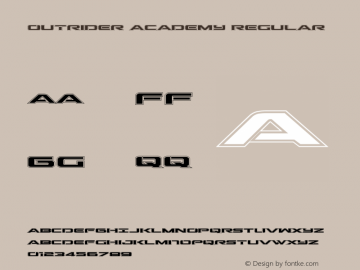 Outrider Academy font family series mainly provide Regular and other font styles. Outrider 3D Italic font family series mainly provide Italic and other font styles. Outrider Laser font family series mainly provide Regular and other font styles. Outrider Leftalic font family series mainly provide Italic and other font styles.